There were only a few things that caught my eye in the recent winter rollout, both of which were lace items. 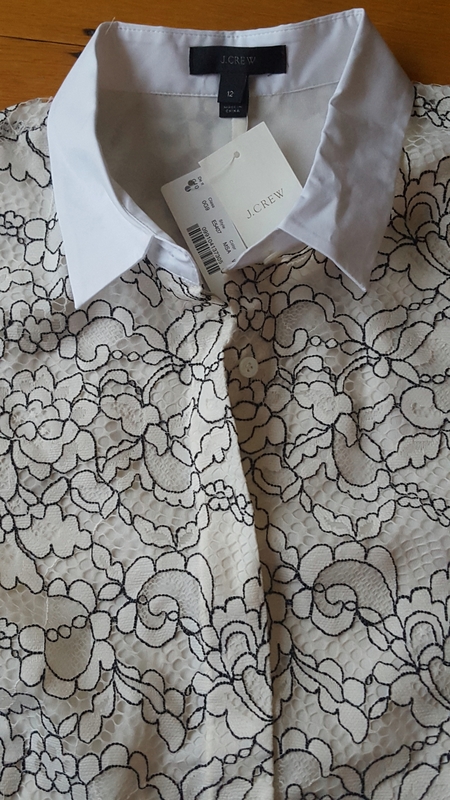 What can I say, it’s holiday time, and J.Crew does lace so well. I always drool over the lace party dresses and only have so many places to wear such a thing and a lace blouse or skirt I can work in to my daily wardrobe no problem. 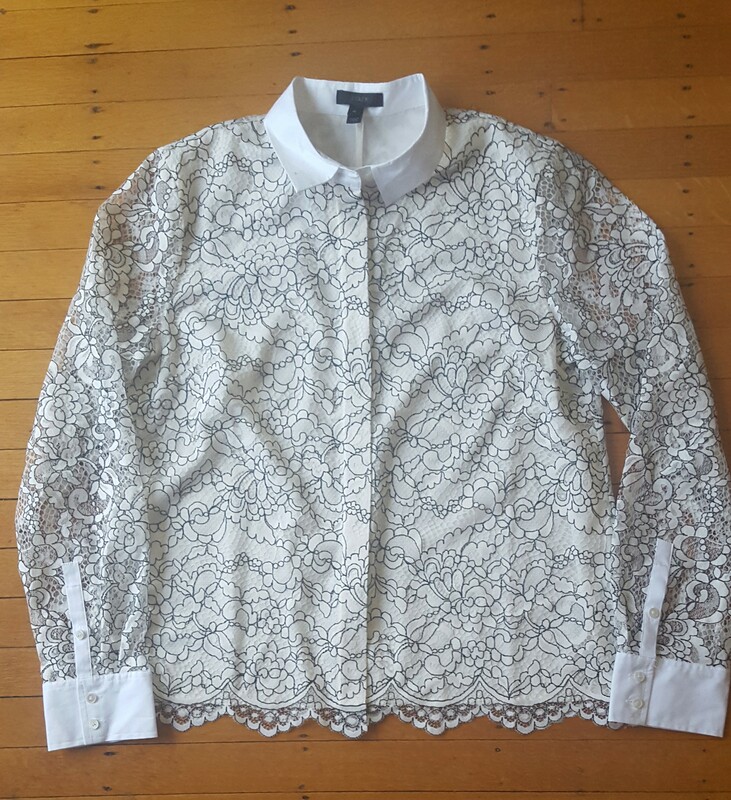 I missed out on the Collection Corded Lace Shirt (which I am still stalking) so I purchased the Edged Lace Blouse in Marine Salt as well as the Contrast Floral Lace Skirt. The blouse comes in sizes 000-16 and also comes in a navy/green colorway. 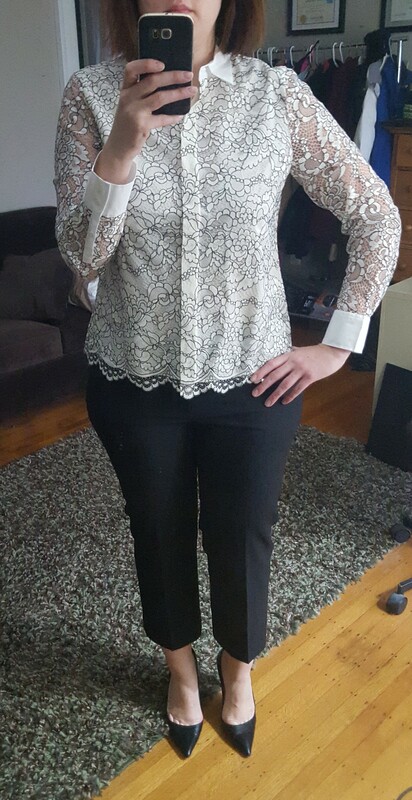 Out of the box, the first thing I didn’t love about this blouse are the white shirtsleeve cuffs. To me, it made the blouse less dressy. 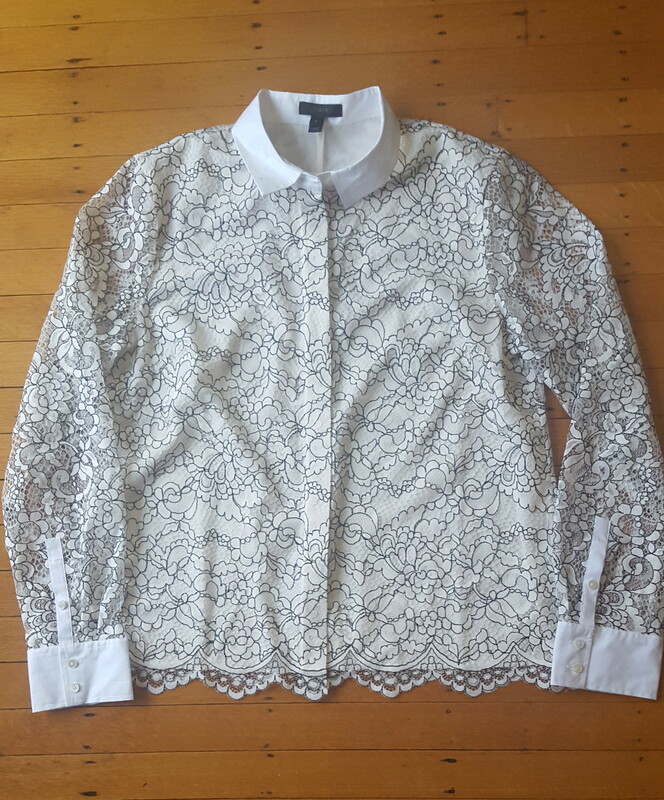 I certainly can see the appeal of making the lace blouse “work appropriate” but I personally would have liked to see a more delicate collar and cuffs. The front of the shirt is lined and the sleeves are sheer. I appreciate that the shirt was made with a lining (albeit polyester) so there is less fussing with a tank or undershirt. The buttons have a covered placket s that also adds to the visual appeal of the front of the blouse. The lace itself I found to be synthetic- I’m not sure how exactly to describe it but in comparison to the lace skirt and one of the lace collection dresses I own, it felt fake. Granted, the blouse is a nylon/poly blend so I guess that is to be expected. But I think I expected it to be a little more delicate. But again, perhaps for a work blouse it is (hopefully) constructed to be a little more durable. I liked the hem of the shirt but do find that it’s limiting to the blouse as I don’t see myself tucking the top in and hiding the hem. The black detail on the blouse helps the pattern pop as well. I think it would work well with jeans and under a suit blazer. I’d keep any jewelry simple. I ordered my usual blouse size of 12 since I almost always need the extra room with a button down blouse. This top runs a bit large, I have plenty of room in the chest area and a bit too much room in the body. I would like it to fit a bit more form fitting and I can see that it is cinched in a bit at the waist but the size is losing that on me. I will say, the more I try it on, the more I like it and after a few weeks of sitting in my closet, it still hasn’t found it’s way back to the store but I still can’t get over how I think the lace looks inexpensive. The shirt has wonderful reviews on the website and is already sold out in several sizes but I’ve seen sizes popping back regularly. I think part of my hesitation is that the blouse is a bit too big on me. I do like the fit in the sleeves though so I’m not sure if sizing down would make it smaller here. I may try a smaller size but I think I might be trying too hard here since I am not in love with the material. So, what do you think? Have you tried this blouse? Love it? Not so much? Would love to hear what you think and thanks for visiting! I ordered this blouse as well, in my usual button front shirt size a size up to accommodate my chest. I was happy to see that the arms were NOT TIGHT, for once. I have some other current season blouses in my regular size, and they also fit well, arms had enough room, but a ‘tad’ tight, thus another reason for sizing up. I like it on, with a jacket. It is hanging on the front of my armoir right now, as I decide to keep or return. Let me know what you decide?! Thanks for your great review and comments. Suzy, thanks for stopping by and taking the time to comment! 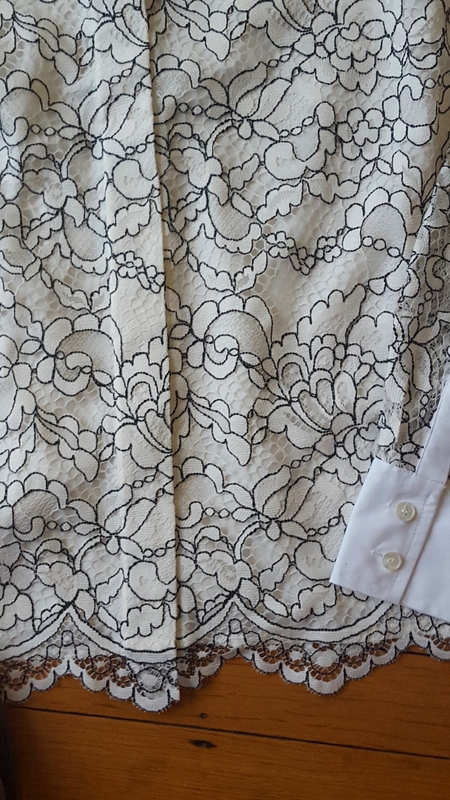 I decided to return the blouse – while it was definitely pretty, there was something about the lace that was off to me and that was my deciding factor to return. But I can certainly see why so many people like it. Hey Anne– the blouse is beautiful (!) on you. Hi, thanks!!! I’ll have to look at it… It looks fine on my desktop but I can see on mobile it’s messed up… Ugh. I’m so not tech savvy in that respect. Thanks for the heads up!! !